Shinto and Buddhism, religions in Japan - Let's travel around Japan! There are two main religions in Japan. They are Shinto and Buddhism. Most of Japanese people believe in both these religions. In addition, there are only about 2 million Christians and at most thousands of Muslims in Japan. But, many Japanese people believing in Shinto and Buddhism also celebrate Christmas and Valentine's Day. In short, Japanese perspective on religion is that believing and praying leads to happiness. Therefore, Japanese people except for Christian don't receive baptism and can believe in multiple religions. In addition Japanese are generally noncritical of other religion, so outbreaks of religious conflict are rare. "Shinto" means "the way of the gods". It is the Japanese religion from the ancient times, centering on the ideas of Japanese intimacy with nature and ancestor worship. All things on earth were created and ruled over by the gods who reside throughout all nature. Mountains, trees, rocks and rivers often become objects of worship. Shinto constitutes the foundation of the sensibility of the Japanese people. But most present-day Japanese people feel their cultural identity through it. Shinto has supported the Emperor system in a religious sense, and even now its ancient customary practices remain as the religion of the Imperial Family. Shinto shrine is called "jinja" in Japanese, and in some shrine it named "jinguu" or "taisha". It is built at sacred area, and objects of worship where a god or some gods reside are enshrined. Generally it is surrounded by the forest. At the entrances of shrine there is a "torii". 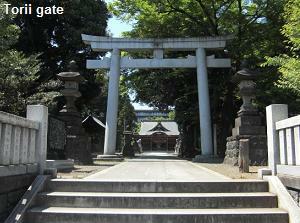 It's the gate to a sacred place and two crosspieces are set on top of two upright pillars. 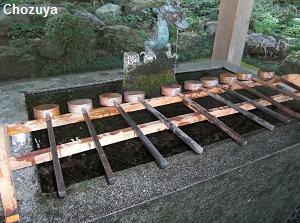 After passing under the torii, you find "Chozuya"(hand-wash station) near approach. Please purify your hands there. At the center of sacred area, there are the main sanctuary and other facilities. The floor of the main building is elevated and roofs are generally thatched with cogon grasses and Japanese cypress bark. In a shrine, there are some "kan'nushi" who is the Shinto priest. They serve the divinities by making offerings and reciting a Shinto prayer. They also perform the Shinto purification for people who come to worship and execute weddings. And in a shrine there are several "Miko". 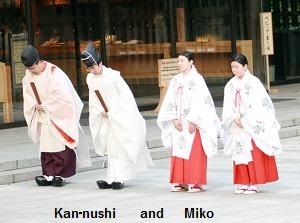 Mikos are young women in the service of Shinto shrine. They assist the kan'nushi in various ceremonies and perform in ceremonial dances. Generally visitors cannot enter the main sanctuary. 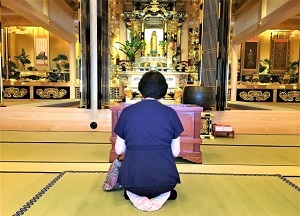 So you must worship in front of the main shrine. You worship in the following steps. Throw a coin into the donation box. Clap your hands twice slowly. "Kamidana" literally means shelf of god. 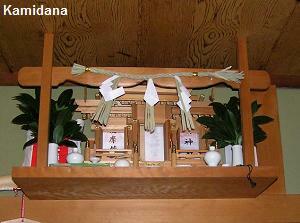 It is a type of miniature shrine placed or hung high on a wall in the room or the office. It is made of wood with roof and steps, and the charms and amulets are put in the center. Occasionally, sake, rice and candles are offered, and people sometimes pray for family safety and business prosperity in front of it. Until not long ago, most families had it in their houses, but recently they have decreased in number. "Mikoshi" is a portable shrine and it appears at the festival of the shrine. On two poles for carring a lavishly decoratrd miniature buiding stands. 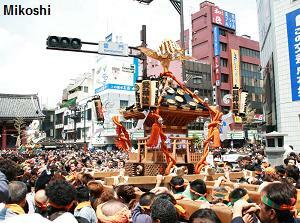 During the festival, people bear a mikoshi on their shoulders by means of the two poles. They bring it from the shrine, and carry it around the neighborhoods. Buddhism was introduced to Japan from China in the middle of the 6th century. Many temples were built in every area under government patronage, and it spread throughout the country. In the Kamakura Period (1185-1333), a number of new leaders appeared and deepened its philosophy. Then, the Zen Buddhism was brought to Japan in the Period by priests who studied in China, and it flourished principally as the religion of samurai. Since that, Japanese traditional culture had been created under the influence of Buddhism. And Buddhism has been deeply rooted in the life of Japanese people together with Shinto. Buddhist temple called "tera" in Japanese. And the Chinese character is pronounced as "ji", so the names of most temples have "ji" at end of the word like "Horyu-ji"
Preists or nuns reside in the temple, and they practice ascetic exercises and Buddhist ceremony, and Buddha statues are enshrined. There are some buildings such as the main temple, an auditorium, a pagoda, a bell tower and so on in the site. Almost all the roofs are tiled. And at the entrance of most large temples, there are two-story temple gates. Most graves are set within the temple site in Japan. People go to the Buddhist temple with their own family's tomb during the Bon Festival in August and equinoctial week. In Buddhism, the soul of the ancestor came back at that time. The Buddhist priests are the persons who have renounced the world and entered the priesthood. They usually shave their heads and wear a Buddhist priest's stole. There are occasions when spiritual cultivation is continued through rigorous austerities, like being pelted by a waterfall. But most priests are also married at their choice. The majority reside in temples where they practice ascetic disciplines, maintain graves, and chant Buddhist sutras for memorial services held at their temples. They also go to chant sutras in homes for funerals and for some private memorial services. This is very difficult thema for me. The follows are the essences which I lerned from some descriptions. All things on earth continue to change eternally. So if you don't think that dying is the end of you, you will get away from the pressure. We all are given a life by chance in eternal changing world. So the exsistance of each person isn't absolute. When you understand above spirits "perfectly", you can enter the calm world. Buddha was awoke to these spirits and taught them to many people in the 5th century B.C. But he didn't leave them in script, so his pupils wrote many scriptures (sutra). So by chanting a Buddhist sutra, we comfort the spirits of dead people. 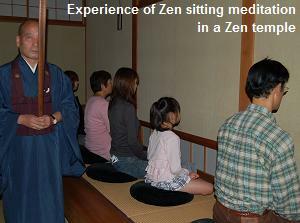 Zen is one sect of Buddhism. In the early 6th century, Indian Bodhidharma introduced it to China, and some priests who studied abroad brought it from China to Japan in the 14th century. According to the Zen teaching, truth goes beyond verbal expression. Therefore, enlightenment can be realized only through sitting in meditation and training in calming the self. You worship in the following steps in front of Buddha statues. If there are a big bell, tincle them. Join your hands in prayer. If you know the Buddhist sutra, chant it. We use a "juzu" when we worship at a temple. It is like a necklace and has 108 beads. The number are said to remove the 108 worldly desires cited in the Buddhist teaching. It is held in the hands when praying to Buddha or worshiping in front of the tomb, so it is similar to the Catholic rosary. 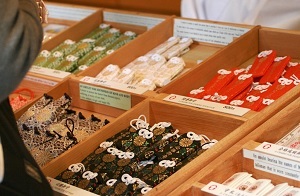 "Omamori" is the Japanese talisman. It is said to bring good fortune and expel evil. Answers to a prayer include traffic safety, success in passing a school's entrance exam, business prosperity, good health, easy child delivery and so on. It is put in a small pouch. So keep on your person, hang in cars, place in your home, or attach to a pillars or a gate. And it is a good idea to gift to your family or lover. 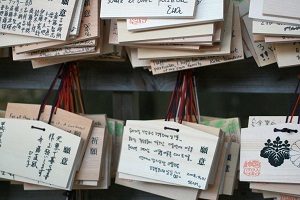 "Omikuji" is a written oracle by drawing lots. Shake a wooden box, and a thin stick with a number comes out. 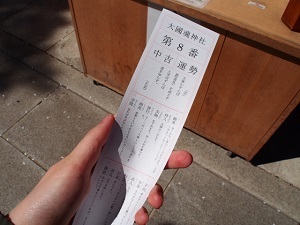 You get the omikuji corresponding to the number. The good or bad luck of your fortune is indicated in it. Also the fortunes about health, academics, business, marriage proposals, and victory or defeat are written. It is a long narrow paper, and usually you tie to a rope or a branch of a trees after you read. But unfortunately, there is no omikuji written in English. "Ema" means picture of horse. As its name suggests, it is a pictures of horses drawn on a wooden board. And you hang it on the wall for Ema. The shrine will satisfy the wish on your Ema. In ancient Japan, there was the practice of presenting horses when praying for something, but this later changed to offering votive pictures of horses. At present, there are other pictures besides horses. Christianity was introduced to Japan in 1549 when the Jesuit priest Francis Xavier from Spain began his missionary work. In its history in Japan, Christianity underwent severe pressure brought by Hideyoshi Toyotomi, the most powerful man in the late 16th century, as an obstacle to the establishment of feudalism. And it was denounced during the World War II as a foreign religion. At present, freedom of religion is recognized by the constitution. The proportion of Christian believers, compared to Buddhists, is quite small, but they have built up a definite social standing with various kinds of activities. Especially in the area of education, there are a lot of private schools, from kindergartens to universities, that base their education on Christianity.